Google Sheets has some great data formatting tools. 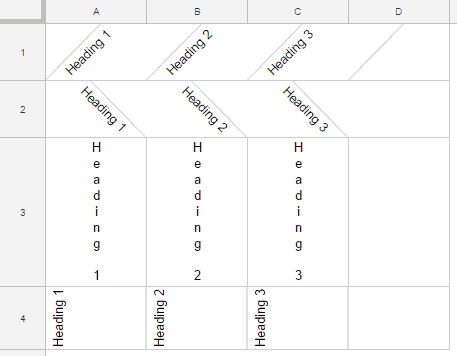 One such formatting feature is the ability to rotate text within a cell in Google Sheets. Select the cells in which you want the text to be rotated. In the Toolbar, click on the text rotation icon. Select the text rotation option you want. You can also specify the angle at which you want to text rotation done. 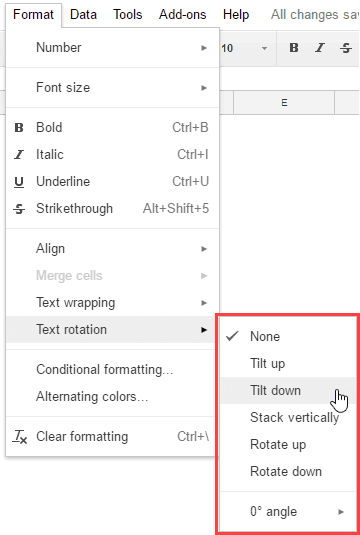 You can also use the Format options in the menu to rotate text in Google Sheets. Click on the Format option in the menu. Hover the mouse on the Text Rotation option. Select from the options that appear. I prefer using the toolbar as it has a visual representation of how the text would look like. How to Create Hanging Indent in Google Docs. Insert Bullets in Google Sheets. How to Apply Strike-through Format in Google Docs.